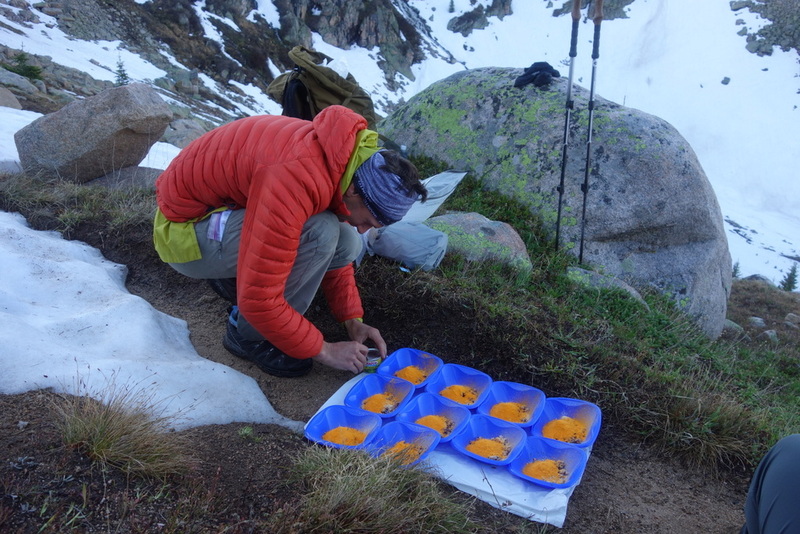 Andrew is well-known for his long and challenging backpacking trips, most recently a 6-month 4,700-mile solo expedition across Alaska and the Yukon. Since completing this epic journey, Andrew has turned his focus to guiding and developing shorter but no less spectacular wilderness routes. 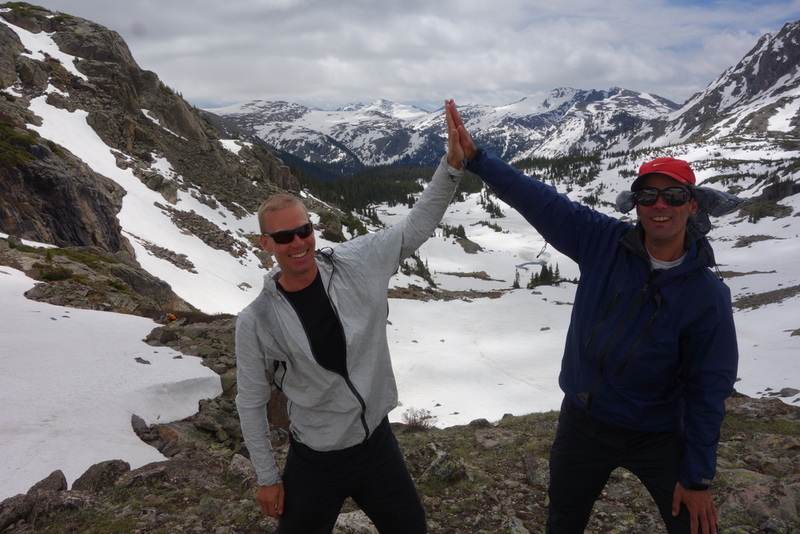 On this trip Andrew was joined by Brian Robinson, the first person to complete the Appalachian Trail, Pacific Crest Trail, and Continental Divide Trail (7,400 miles), all in the same year! 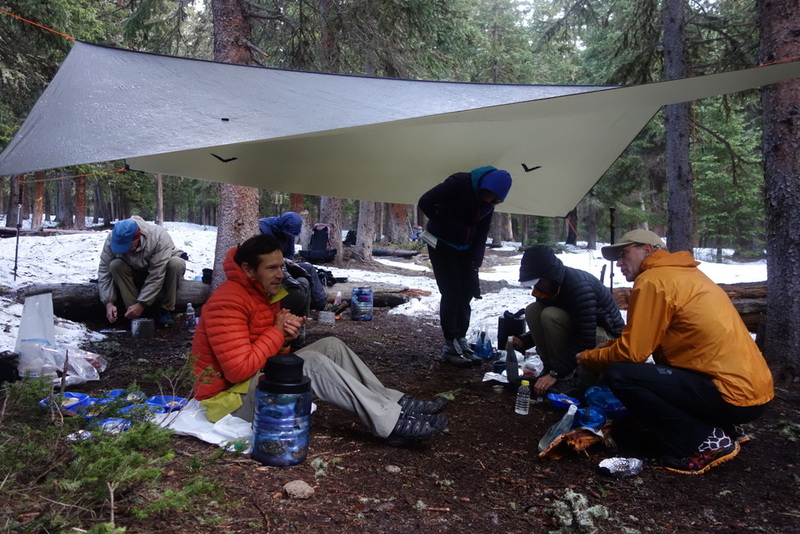 We met at the trailhead where Andrew and Brian handed out food and demo gear. 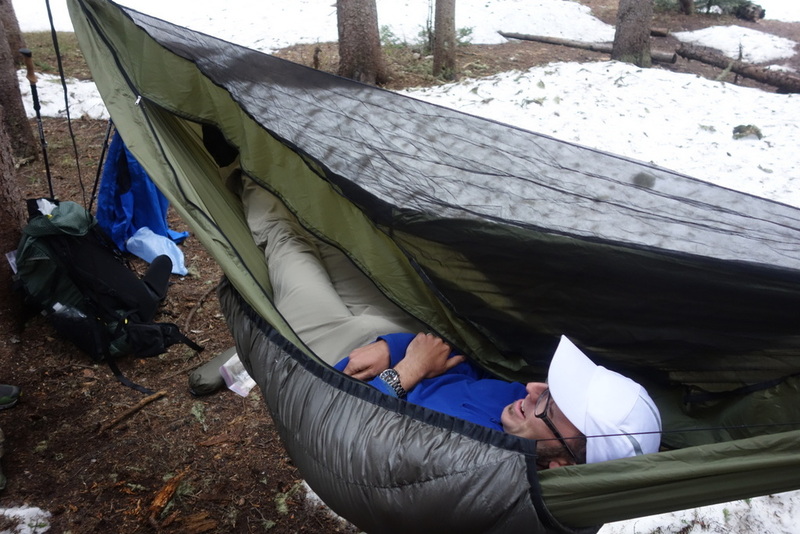 Being able to try new shelters, sleeping bags, and backpacks is a nice perk of Andrew’s trips. 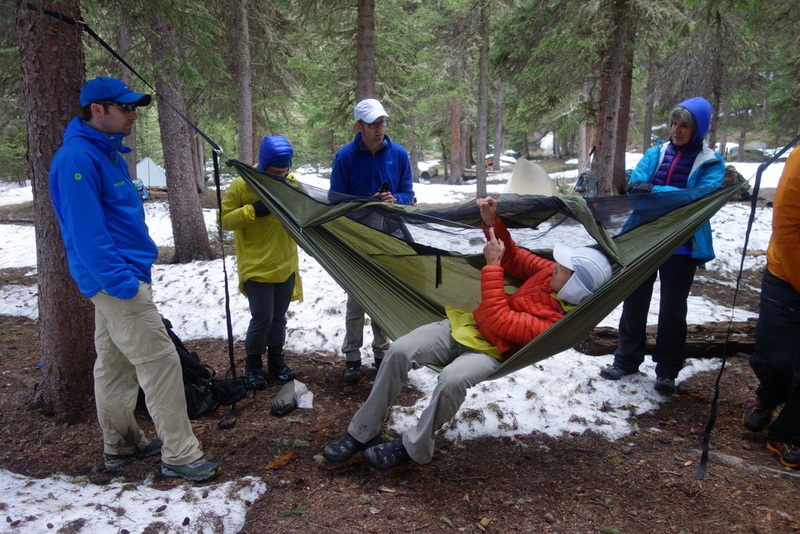 Half the group went with hammock sleeping systems. 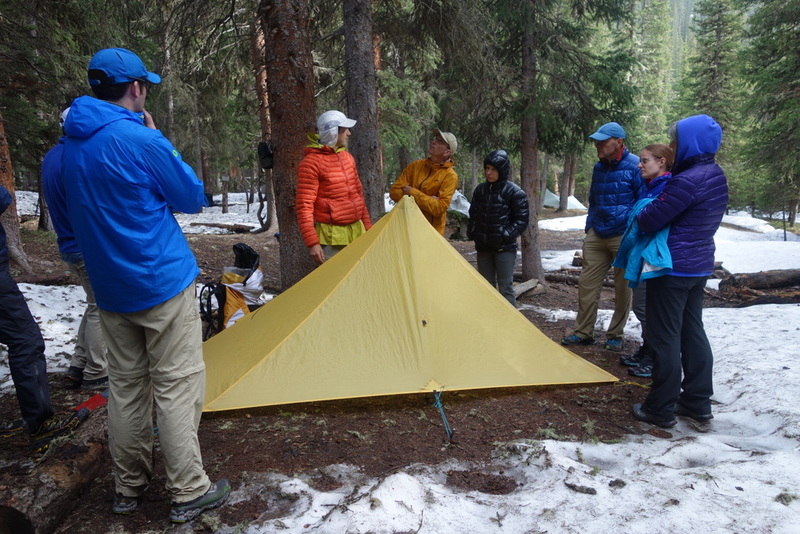 I chose a Solomid, the same storm-proof shelter that Andrew took on his Alaska-Yukon expedition. Our first day was a leisurely one, giving us the opportunity to get to know each other and for Brian and Andrew to share wisdom on such practical matters as how to poop in the woods and how to cook dinner over a can of cat food filled with alcohol (a surprisingly simple and powerful method). Day 2, 5:00am – I wake up with a startle to a huge boom of thunder! Colorado gets frequent afternoon thunderstorms but this early morning wake-up call was rather unexpected. Our objective for the day was to adjust to the altitude and to get above snow-line where we can practice off-trail navigation. 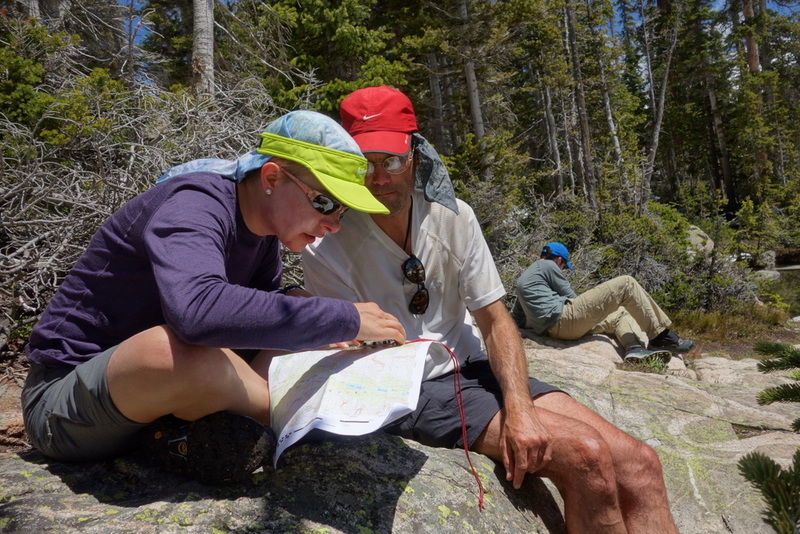 Learning how to use a map and compass seems to elude a lot of hikers, especially those who stick to established trails. 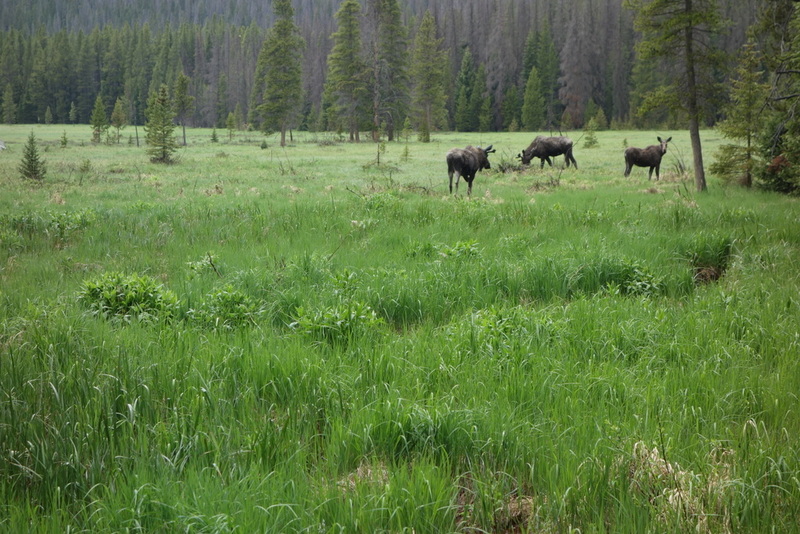 As soon as you venture off trail, this skill becomes much more important. 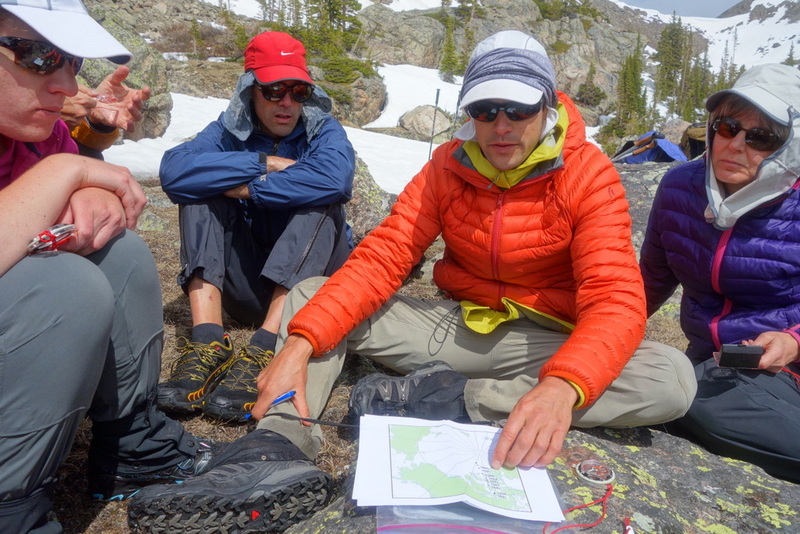 Andrew has a knack for explaining navigation in terms that are easy to understand. 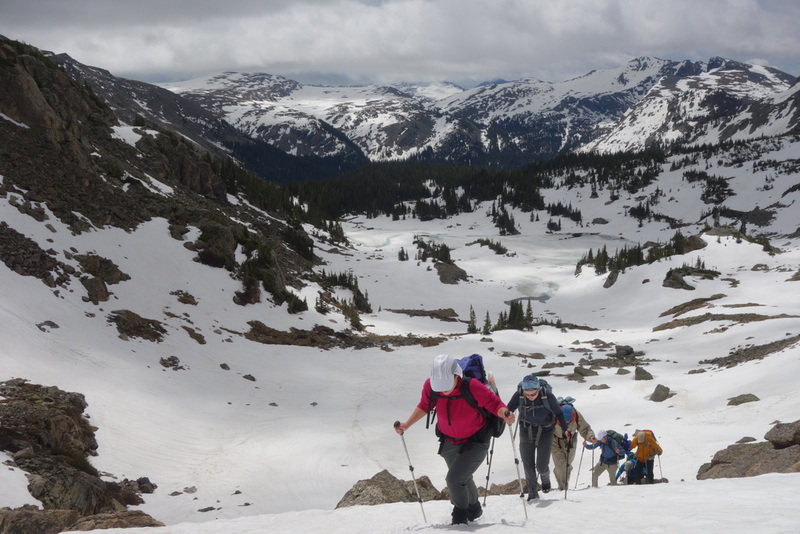 After the navigation workshop, we had a choice: go over a pass and down into the next valley, head up the ridge onto a high alpine plateau, or simply return to camp the way we’d come. We decided to climb up and explore the ridge. Up the ridge or over the pass? 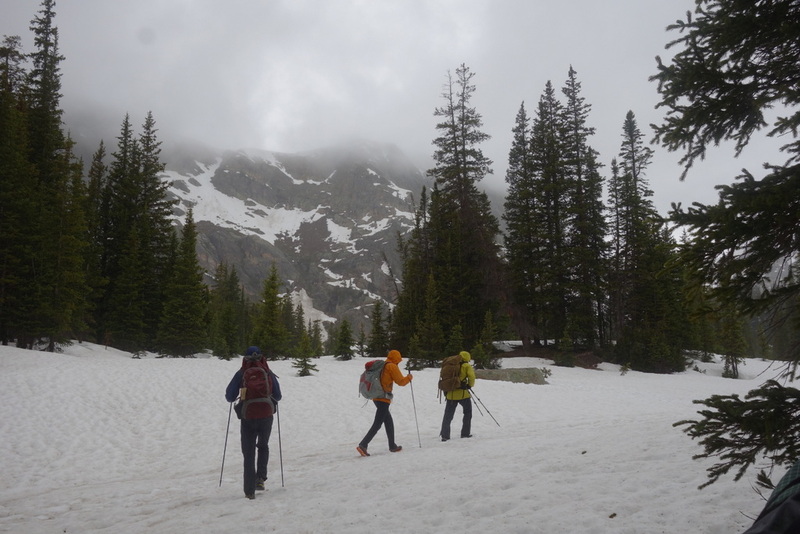 For many of us, this was our first time travelling extensively on summer snow while wearing trail running shoes. Despite that, everyone kept a good pace. 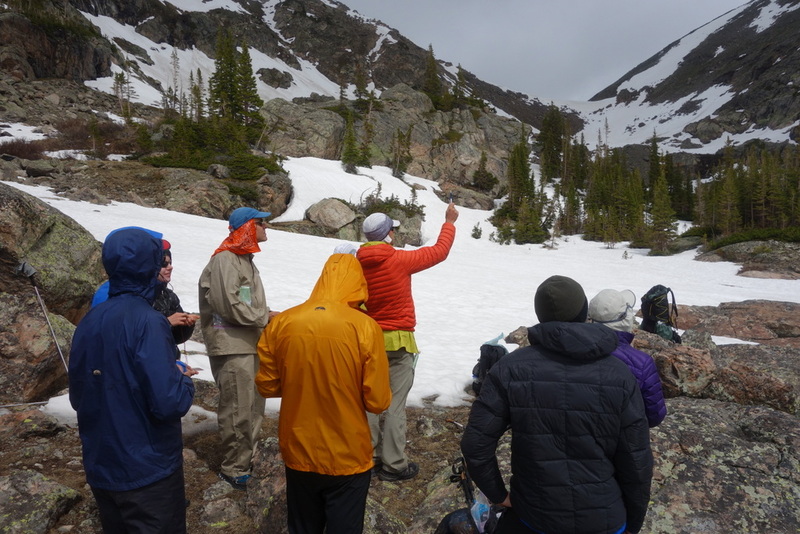 Andrew demonstrated how to securely kick steps into the snow and how to pick a path that minimizes the potential for a fall. 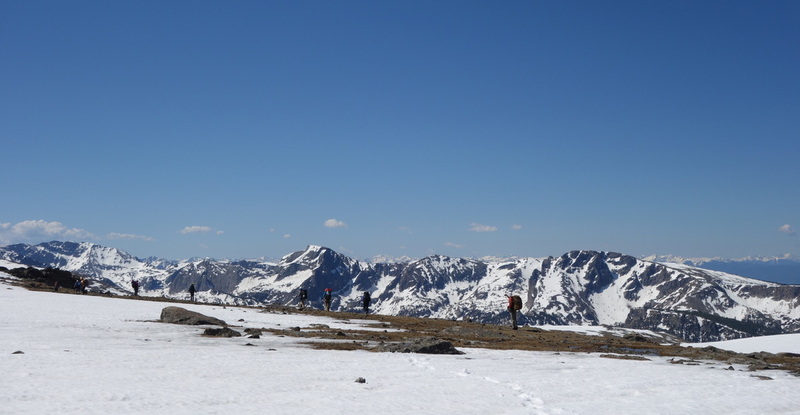 I was happy to make it up onto the ridge in good time but I quickly felt the altitude getting to me. 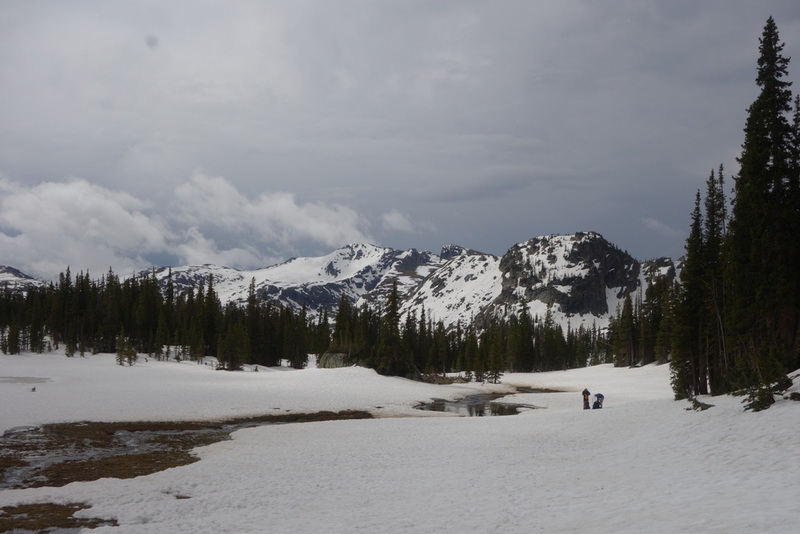 We were at 12,000 feet – a big change from sea level a few days before. I felt drained and my balance wasn’t quite right. To make things more challenging still, a thunderstorm blew in with lightning a little too close for comfort. Brian and Andrew moved quickly, making sure we all got down safely. As we descended, I felt better initially but I didn’t feel the improvement I’d expected. I was still unusually tired and my thinking seemed muddled. Despite trekking in Nepal and summitting Kilimanjaro, this was the worst I’d ever experienced altitude sickness. Everyone was very supportive, though, and helped me get back down. When we got into camp I lied down for an hour but still felt off. A good hot dinner and relaxing around a crackling fire helped but I was still unsure about going up high again the next day. I’d just have to take it slow and steady and see how things go. 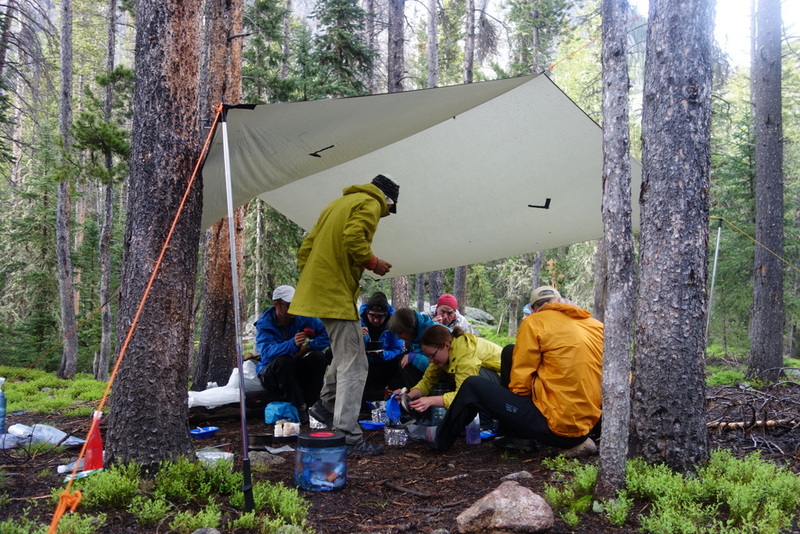 Day 3 – we set off at 5:00am, skipping breakfast in camp, instead saving it for an hour down the trail. On my own backcountry trips, I love to get an early start then stop for breakfast at a beautiful viewpoint once the weather warms up a bit. The meals on this trip ranged from pretty good to delicious. We each carried some basic ingredients but I’m pretty sure Andrew and Brian shouldered most of the load. Luckily, I felt better as we gained altitude. I’m sure that the gradual pace helped. 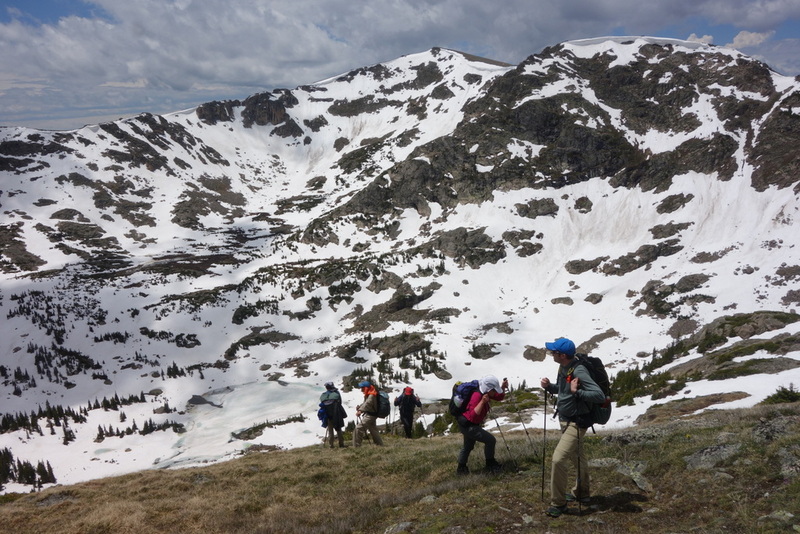 This was such a fit group of hikers that the quick ascent the day before had been too much for me. 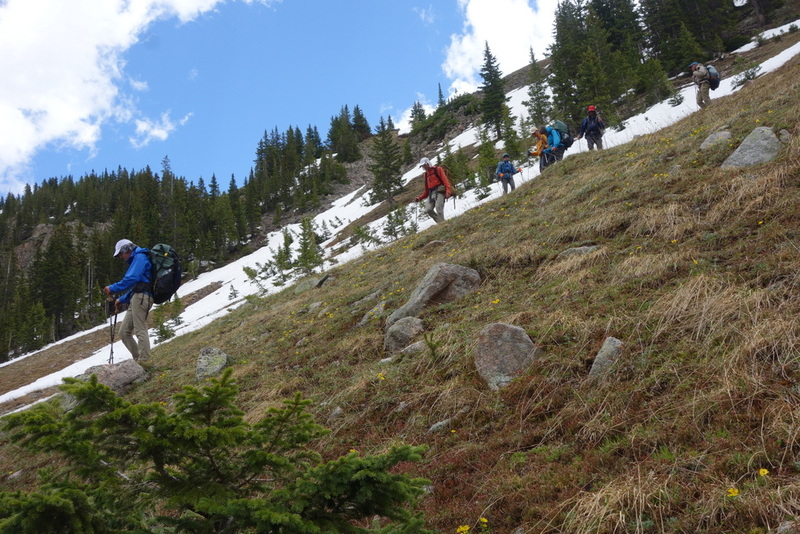 Getting up onto the Bighorn Flats at 12,000 feet and gaining strength as we went was a big relief. The hardest part of the day wasn’t the climb up but the descent back down. The steep trail switch-backing down to North Inlet was still covered in snow, forcing us to kick steps and carefully avoid slipping. It probably wasn’t as bad as it looked but the snow added an element of challenge that pushed all of us clients a bit out of our comfort zone. This is where Andrew and Brian’s experience really stands out. They remained fully confident, picking a safe and quick route down the slope. 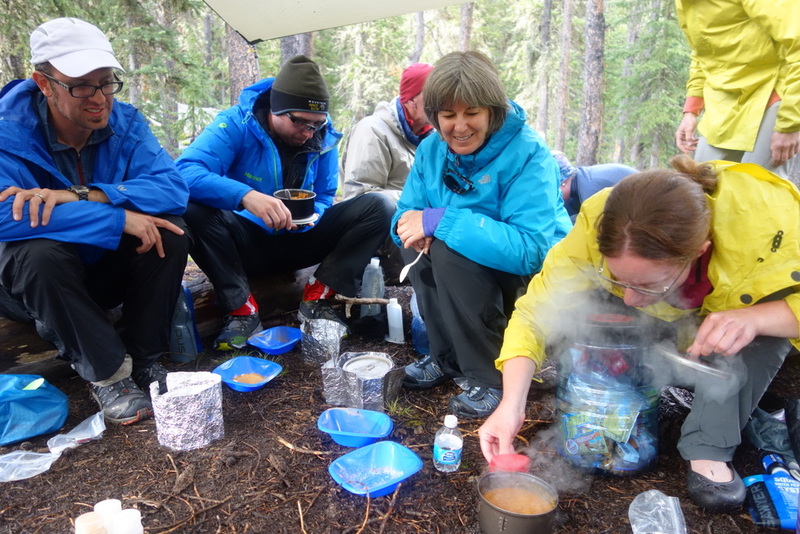 In camp we enjoyed another great dinner (you can find Andrew’s recipes here). Andrew asked everyone how they felt about the day and their thoughts for the following day. I like this open sharing. 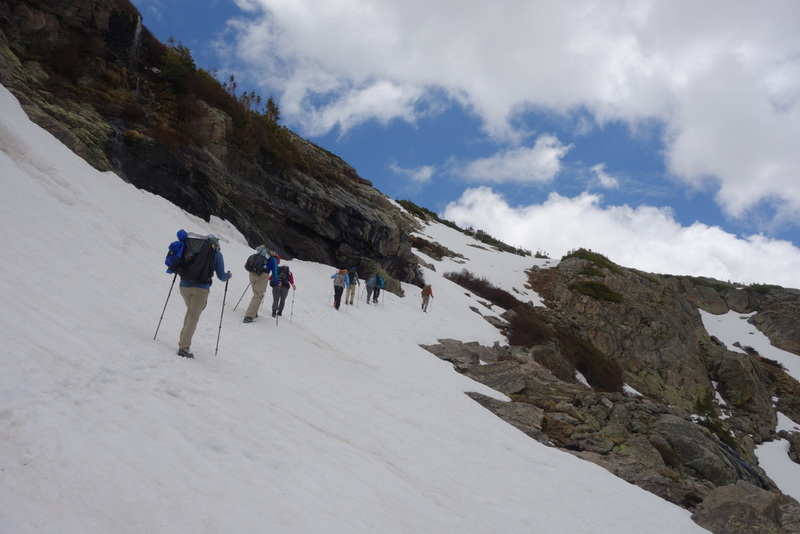 We had planned another big day over a high pass covered in snow and, probably, another tricky descent. Today had been harder on everyone than I’d realized, as much mentally as physically. Day 4 – we awake to a beautiful clear morning. We’d decided against doing another big climb today and instead hike up to Lake Nokoni and Lake Nanita for some relaxation. In all honesty, I was a bit disappointed to miss out on the kind of challenge we’d had over the previous two days. But this kind of situation is where Andrew and Brian’s experience as skilled guides really benefited the trip: they took this opportunity to focus on education rather than elevation. 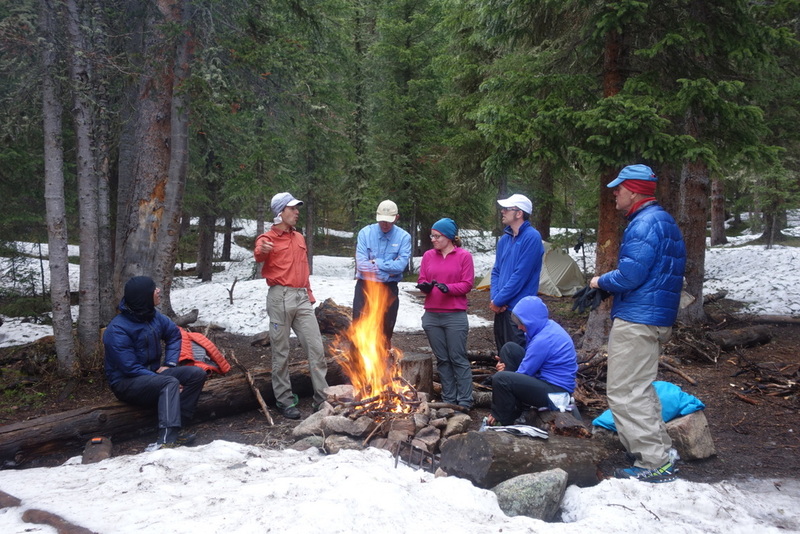 We did a workshop on tying knots, got much deeper into map and compass work, and practised following a snow-covered trail. 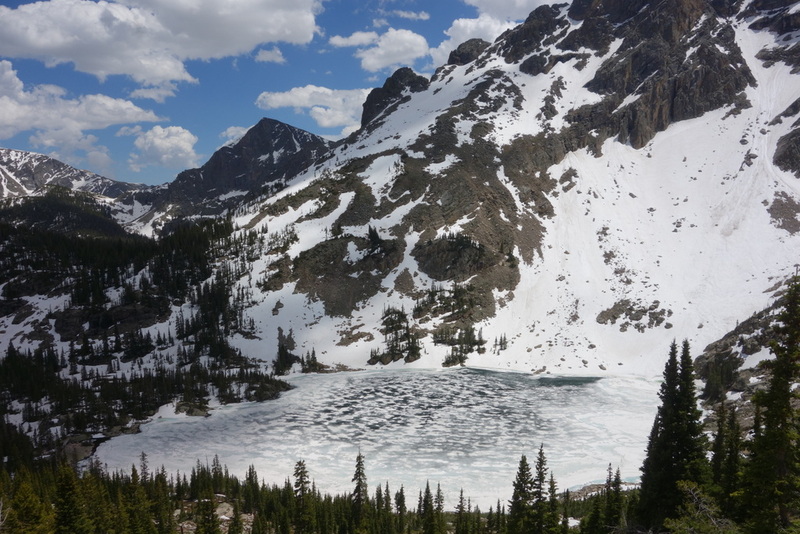 We had the option to stay at the lake and relax or climb up higher peaks for great views. What might have been a trying day turned into a great opportunity to learn with just the right level of challenge for everyone. That’s got to be cold! I think one of the things that has stalled the development of hiking & backpacking is that they’re not competitive sports. Look at cycling or running or even mountaineering – we’ve seen consistent advances in technology and some incredibly lightweight and functional gear as a result. 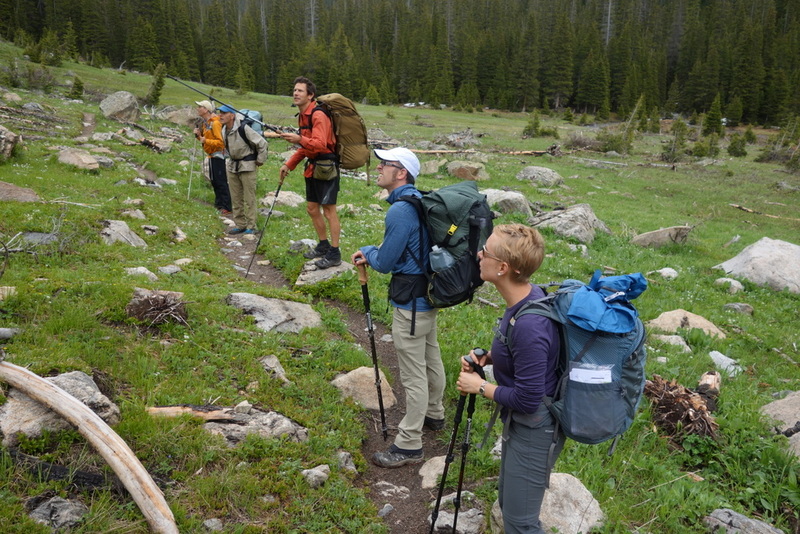 Backpacking is seen as simply recreational so it lacks that same kind of drive to win. Imagine if you could spend five days with Reinhold Messner or Fabian Cancellara or Kilian Jornet, picking their brains on every detail of their sport. 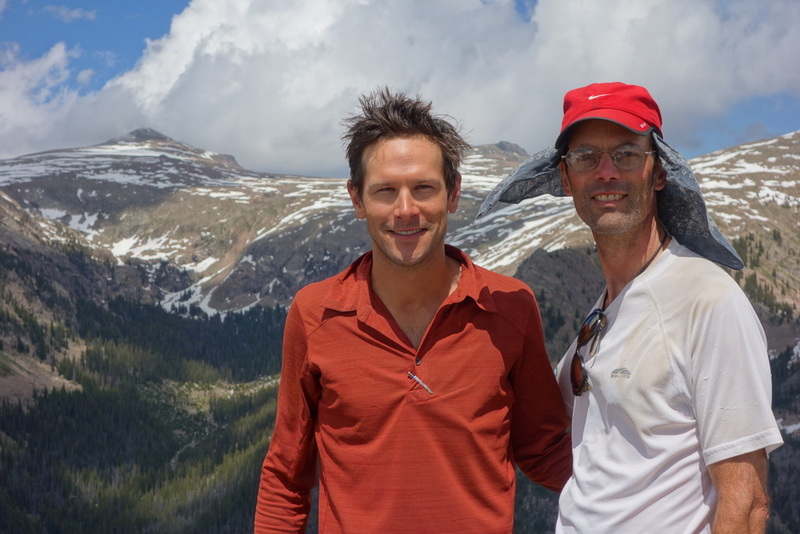 Andrew Skurka and Brian Robinson may lack the fame of these legends but, when it comes to long-distance hiking, they’re among the very best you’ll find. Both trips I’ve done with Andrew have been great learning experiences, a big jump forward from the trial-and-error method of learning from my own mistakes. I’m sure I’ll be back for another. Looks like a great trip! 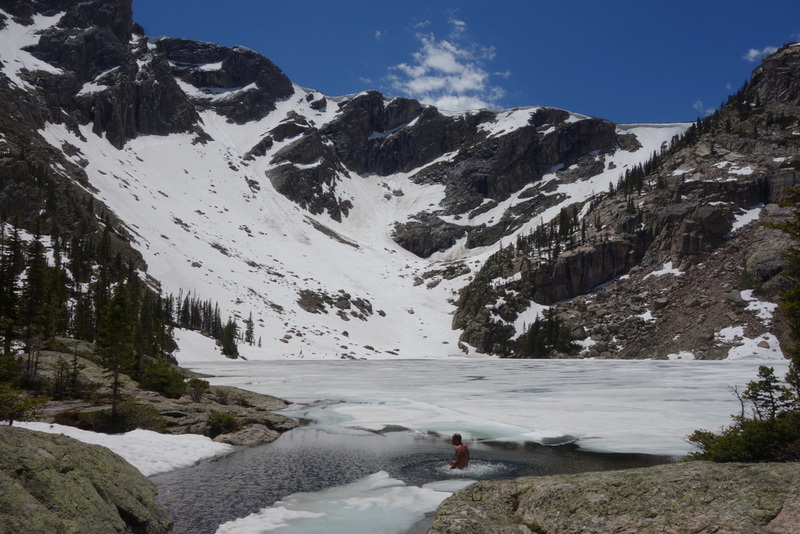 You couldn’t pay me to jump in the glacier lake though! Nice summary of a superior experience. Your pictures lived up to the hype! !